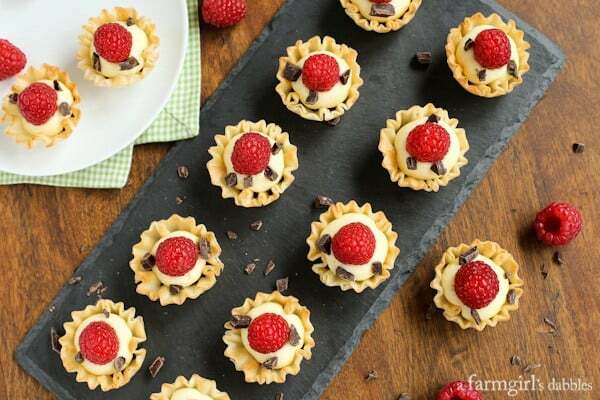 These Mini Phyllo Cups with Coconut Cream, Raspberries, and Dark Chocolate offer a beautiful sweet bite for any occasion. We just bid farewell to March, Easter is peeking from around the corner, and spring is begging to be let loose from its cold temperature confines. My mind is slowly drifting away from a desire to eat an all-out comfort food menu, to one of lighter fare. I’m thinking about grilling outdoors, plucking ultra tender and delicious greens from our garden, and pouring lemonade into tall glasses filled with ice. Yes, I’m in a spring and summer state of mind (waiting patiently for the temps to rise so I can actually break out the flip-flops). 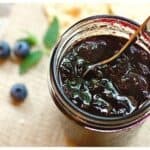 If you’re looking for a pretty and super tasty way to add a little sweetness to this weekend’s Easter celebration, or any gathering coming up this spring and summer, then I have just the recipe for you. 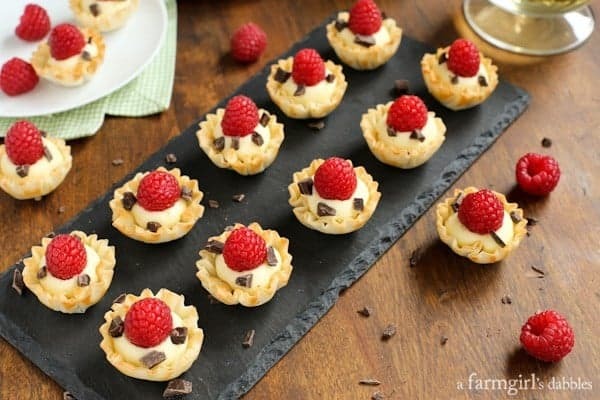 These Mini Phyllo Cups with Coconut Cream, Raspberries, and Dark Chocolate offer dessert in miniature-sized portions, beautiful little bites for any occasion. 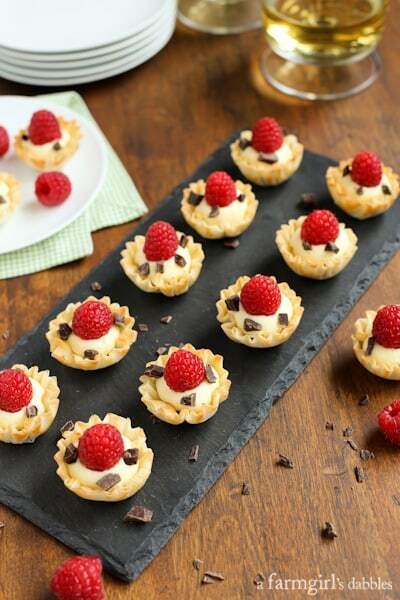 Mini Fillo Shells by Athens Foods are great for creating individual desserts and appetizers. I’ve been using them for the past couple years, smitten with their versatility and pretty looks. If you’ve never seen them before, just look for them in the pastry area of your grocery store’s freezer section. They’re so easy to work with. And who doesn’t love to eat that delicately flaky phyllo dough? I pre-baked the shells for this recipe, to give the phyllo extra crispiness. The shattery layers of dough are a lovely contrast to the softer textures of the coconut cream and raspberries. A bit of melted dark chocolate is then spooned into the bottoms and left to cool and harden before dollops of luscious coconut cream are added. 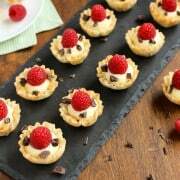 These mini phyllo cups with coconut cream are then finished off with bright red raspberries and chopped dark chocolate pieces. Some call this work. I call this play. Ohhhhhhh…sweet, delicious play. Preheat oven to 350°. Remove shells from all packaging. Place empty shells on a baking sheet and bake for 3 to 5 minutes. Remove from oven and allow shells to cool completely. Gently melt 3 ounces of the dark chocolate in a small bowl in the microwave, taking care to not let it scorch. Let chocolate cool for a bit before spooning it into the bottoms of the phyllo shells, dividing evenly between the 30 shells. Let cool completely until chocolate is hardened. To speed up the hardening, the shells can be placed in the refrigerator for a few minutes. 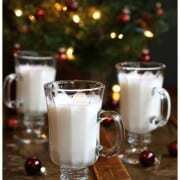 With an electric mixer, whip cream, dry pudding mix, and powdered sugar until stiff and thick, about 2 minutes. Add coconut extract and mix just to combine. Place coconut cream mixture in a pastry bag fitted with a large plain tip. Pipe a dollop of the mixture onto the chocolate on the bottom of each phyllo shell. Gently press a raspberry into the top of each coconut cream dollop. Chop the remaining ounce of dark chocolate into very small pieces and press a few pieces into each of the coconut cream dollops, dividing the chocolate pieces evenly amongst the 30 phyllo shells. These can be assembled up to three hours prior to serving, stored in the refrigerator. 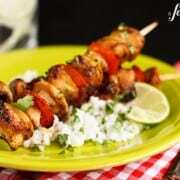 For more recipes using Athens Mini Fillo Shells, go here. And for more details on the Fillo Dough and other Athens Foods products, be sure to follow them on Facebook, Twitter, and Pinterest. Disclosure: This post is sponsored by Athens Foods. Thank you for supporting the brands I so carefully choose to work with, that help make this site possible. All opinions are my own. These little pie/phyllo cup bites are adorable and delicious looking! The combo of raspberries and chocolate are my favorite! Thank you so much. I agree – raspberries and chocolate are SO GOOD together!! I always mean to keep phyllo cups on hand and keep forgetting!! Thanks for the reminder! They’re just the handiest thing for appetizers. Thanks, Liz! What perfect little bites! 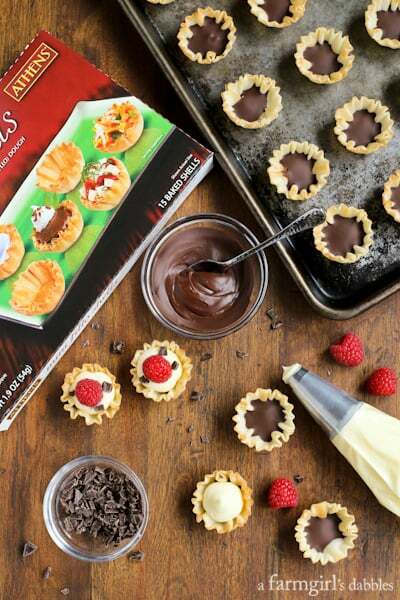 Those phyllo cups are genius – they make a tasty (and pretty) recipe like this so easy! Thank you so much, Alida! Phyllo cups are seriously the best. I feel like they just let up make little tartlets whenever we want, without the fuss. These look divine. So elegant! I love how easy they come together! These are the cutest little bites that also look delicious! Fun recipe!! What delicious bites!! I would love to make these this weekend! These little bites look amazing!!! I love those cute fillo shells too. They make a cute individual dessert quickly and beautifully. The ones you made sound scrumptious! Hi Donna! Aren’t those shells awesome?! So versatile and delish, and just the right “poppable” amount! Beautiful little gems to serve to guests this holiday weekend. I would not trust myself alone with these. Dangerous!! Hi Stacie – I used Lindt “70% cocoa – smooth dark” for this recipe. Love these kind of easy one-bite desserts. So pretty for Easter, Brenda! Thanks, Sandy. Happy Easter to you and your family! I love how easy, delicious and pretty these are.